We’d love your help. Let us know what’s wrong with this preview of Cry of the Sea by D.G. Driver. Juniper Sawfeather is choosing which college to attend after graduation from West Olympia High School next year. She wants to go to San Diego to be far away from her environmental activist parents. They expect her to think the way they do, but having to be constantly fighting causes makes it difficult to be an average seventeen-year-old high school student. Why do her pare Juniper Sawfeather is choosing which college to attend after graduation from West Olympia High School next year. She wants to go to San Diego to be far away from her environmental activist parents. They expect her to think the way they do, but having to be constantly fighting causes makes it difficult to be an average seventeen-year-old high school student. Why do her parents have to be so "out there?" To ask other readers questions about Cry of the Sea, please sign up. What is her mom"s name? This is the second book I've read by D.G. Driver and I REALLY enjoyed it. Driver has a great voice for young adult and really pulls the reader into the story. She makes the reader care for the characters. Juniper Sawfeather is a senior in high school and her parents are environmentalists so of course she gets sucked into their causes even if she might not want to be involved. After making her parents mad when she says she doesn't want to go to their college of choice, she goes with her Dad to an This is the second book I've read by D.G. Driver and I REALLY enjoyed it. Driver has a great voice for young adult and really pulls the reader into the story. She makes the reader care for the characters. Juniper Sawfeather is a senior in high school and her parents are environmentalists so of course she gets sucked into their causes even if she might not want to be involved. After making her parents mad when she says she doesn't want to go to their college of choice, she goes with her Dad to an oil spill along the shores of Washington State the oil company Affron has caused, the company her Mom is trying to stop from shipping oil until their ships are fixed. While along the shore, they stumble upon three mermaids who are covered in oil and trying to breathe. Soon everything gets out of control as the news about the mermaids ends up on YouTube. Driver does a great job of showing the struggles of a teenager on the verge of adulthood trying to be a kid yet trying to be mature about their choices. There is great character development. I look forward to seeing what other trouble Juniper can get into. I had a hard time putting this one down and when I wasn't reading it, I was thinking about Juniper and the mermaid. What an amazing story! Juniper (June) is a young woman of substance and holds firm to who she is despite heavy pressure from her parents and peers at school. She's the kind of role model for girls that I love to see in YA books. As expected, this book has a strong message about environmentalism but I'm impressed that the author was able to convey it without sounding preachy in the slightest. You're not going to get a sermon but you will see enough of the damage caused by oil spills to be horrifie What an amazing story! Juniper (June) is a young woman of substance and holds firm to who she is despite heavy pressure from her parents and peers at school. She's the kind of role model for girls that I love to see in YA books. As expected, this book has a strong message about environmentalism but I'm impressed that the author was able to convey it without sounding preachy in the slightest. You're not going to get a sermon but you will see enough of the damage caused by oil spills to be horrified by it. To be honest, I'm barely interested in the subject but I went through a whole range of emotions and I cared about what was happening. Ladies and gentlemen, that can only be credited to a writer with great talent. I feel so bad because I was approached to review this book early last month. When D. G. Driver approached me I was just getting ready to leave on my cruise vacation, couple that with the fact that I've never read a 'mermaid' themed book, it seemed like it was the perfect read for the trip. Then I get there, and reading inside seemed kind of silly since I was on vacation to be outside in the beautiful sun and heat, and reading on my iPad outside is nearly impossible - if nothing else, it's not good for my eyes. So I didn't read this while on vacation. And then it's taken me a few weeks in addition to get to it. I just hope she didn't think I'd forgotten about her. As I said, I have never read a mermaid book, mostly because I have a very difficult time with a half/half species relationship concept. I know that there's the whole "they turn to humans when dry" aspect, but I don't know - I mean they are half fish, and the normal theme of mermaid with human just never really appealed to me. (I feel a bit hypocritical because I do like werewolves and vampires and such, it's just a silly preference I suppose.) However, this book is not your typical "Little Mermaid" themed kind of book. Imagine discovering a new species - one that is human-like as some apes and monkeys are,, and yet very much like a a fish too. This appeals to me. What I Loved: The story-line if this book was great, we have a typical teenager trying to bust the seams of her parent's mold and do her own thing. Juniper's making her way in life while not abandoning her upbringing. I like that. I like that her relationship with her parents seemed to be pretty realistic; once the dust settles from an argument, they are still a family and work through their issues. Any kind of animal activism I can stand behind, even if this is based upon a mythological creature, a lot of things still stand true. Do we ever stop and think about the emotions of animals that we treat as objects? I don't mean your pets, but what about other animals. Cows? Goats? Do you want to know what caused me to become Vegan? People posting silly animal videos on Facebook - and watching them and realizing that these animals were expressing happiness, joy, love, at times compassion toward one another - sometimes toward animals that weren't even their own species. Sometimes animals show more humanity than humans, I think. So a book that has even a little hint of compassion and love towards animals - no matter what kind, is good to me. But that's not the only reason this book was good. This is a well written young adult book with conflict and some action, some teen drama and a touch of romance. Not So Much: This is an opinion on a character rather than on the book itself, but I will say that I wasn't found of Juniper's mother, she was pretty over bearing and didn't have many redeeming qualities. Near the end I was wondering what was going to happen with that relationship, because she was just a little over the top. Then her dramatics were kind of shoved aside and never really revisited. Rating: 4 Stars - A good book, great for teenagers! I really enjoyed this book. The depth of the main character is amazing. You can really feel her struggle with not wanting to be thought of as crazy like her parents. Toward the end she come's to realize that what her parents fight for is more important than all else. Juniper is a very likable character. I really enjoyed getting to see the world through her eyes. Also, her parents are pretty stinking awesome too. Honestly, who doesn't want mermaids to be real? This book brings up a lot of great p I really enjoyed this book. The depth of the main character is amazing. You can really feel her struggle with not wanting to be thought of as crazy like her parents. Toward the end she come's to realize that what her parents fight for is more important than all else. Juniper is a very likable character. I really enjoyed getting to see the world through her eyes. Also, her parents are pretty stinking awesome too. Honestly, who doesn't want mermaids to be real? This book brings up a lot of great points about our compassion ( or lack there of) for creatures other than ourselves. It brings the question.....would we care more about the pollution of our oceans if sentient humanoid like creatures lived there? 'Cry of the Sea' had me at mermaids. I was hooked when I learned that these weren't Disney mermaids, but what the author believes mermaids may be like if they evolved naturally in the ocean. All June wants to do is graduate high school and go to college in California, where people won't know her as the daughter of the environmental activists. As it is, she's pretty much an outcast in school. She spends her free time saving the whales instead of hanging out at the mall. Then, an oil spill occurs. Wh 'Cry of the Sea' had me at mermaids. Then, an oil spill occurs. When June and her father rush to the beach to film the destruction before the oil company can cover it up, she's shocked to discover what she believes are three humans lying on the beach, coated in oil. Upon arriving at their side, ready to help, she realizes that they are not humans. They are mermaids. This begins her rush to save the mermaids and hopefully use the tragedy of their injury as a way to finally put a stop to the oil companies and their lack of care for the Earth. Along the way she teams up with college marine biology intern named Carter, who just happens to be easy on the eyes, as well as the group of popular girls at school, much to her dismay. This story was all over the place, in a good way. I never really knew what would happen next. The ending wasn't what I wanted, but I think it takes a brave author to not give their readers the ending they want. The ending made sense. I really want to read more about the mermaids and June and her other adventures. Carter being there wouldn't hurt either. * NOTE: This book is published by the company I work for and I do receive royalties on sales for my work designing the cover. Despite that, I still think this is an amazing book and highly recommend it. I feel honored to have had the privilege of designing a cover for such an amazing story by such an amazing author. "Cry of the Sea" is a beautifully written, emotional and inspiring story. It is a wonderfully told novel with messages about finding ourselves, being true to who we are and it also helps raise awareness about environmental issues. The characters started out interesting and full of good intent. I enjoyed this book throughly from start to finish. And I am very excited to have discovered this new (to me) author. Looking forward to her other books! This is a story about a teenager, but unlike many teen leads, Juniper Sawfeather didn't drive me crazy. In some ways she does fill the typical teen role--she has a best friend, she can't seem to fit in, her parents drive her crazy--but not in an annoying way. Unlike most of the teens I've read, she has real goals like making the world better and a specific degree in college, and doesn't fill the pages obsessing over boys. I mean, she is interested in a boy, but I appreciated the way it w 5 Stars! Cry of the Sea by D. G. Driver was a very interesting book about the mystery behind mermaids. It was structured differently than any other mermaid book I have read for the young adult audience. The story itself was quite realistic when it comes to this situation happening in real life. I believe that the people around us would act in this way. The main character, Juniper Sawfeather (or June), is a 17 year old girl living in Washington with her activist father and lawyer mother. I really liked the Cry of the Sea by D. G. Driver was a very interesting book about the mystery behind mermaids. It was structured differently than any other mermaid book I have read for the young adult audience. The story itself was quite realistic when it comes to this situation happening in real life. I believe that the people around us would act in this way. The main character, Juniper Sawfeather (or June), is a 17 year old girl living in Washington with her activist father and lawyer mother. I really liked the connection that June had with her parents but mostly the connection she had with her father. The first few chapters made me smile as they joked around and had a tiny little wrestling fight before making dinner. June does not want to follow her mother's footprints and wants to be part of the dirty work when it comes to taking care of the environment. This book is different when it came to the mermaids portion because the author didn't make them seem almost completely human. She described them as having webbed fingers, holes for ears, and gils on their necks. This gave me an interesting image as I was reading through the description of the mermaids. It made me see them in a more realistic light besides the normal way most authors portray them. I would imagine mermaids looking like this if they were real because they are an evolution from fish. Just having a fish tail isn't enough. When it comes to the story, it was very good. It starts out with June and her father needing to go down to the ocean because there has been an oil leak thanks to an oil company called Affron Oil. They have leaked oil into the ocean and they will need to go down to report this happening plus help out the animals. This is where they find three mermaids that they need to save. Two die pretty quickly but they transfer one to the Aberdeen Sea Mammal Rescue Center. A young man named Carter Crowe comes to help them transfer fish back to the center. You can tell quickly that June and Carter have a connection and that was a good connection to keep me wanting more of them. He seemed perfect for her considering his background and the fact they have a lot in common. The conflict concerning the mermaids started to become suspicious when two Affron "spies" came to check on the center and they seemed to be looking for the mermaids... as if they knew they had them. Afterwards, some conflict happens when June sends her best friend, Haley, a video of the mermaids. She ends up sending the video to the mean girl, Regina, and she gets it to become viral. This causes June's life to become more hectic. The most annoying part of this was Regina and her friends. I wanted to shake them and tell them to go away because they were not wanted. The last portion of the book was about June trying to figure out Affron Oil's secret. It was obvious that they knew about the mermaids before June and her father found them. So what were they doing? What do they want with the mermaids? It was interesting to find out that they secretly had 100s of mermaids in this tiny tank! I felt so bad for them and choked up a little when some of them died. Overall, this book was pretty good and I would recommend it to people if they wanted to read about a mermaid story that was more realistic. I enjoyed the cute romance and I wish I could read more about them. To see what June actually decides to do. Possibly stay in Washington with Carter to try and find her mermaid? I would also read a novella by this author about the mermaids and that land. For you eco-friendly and mermaid loving fans, you'll want to pick up this young adult novel. Disclaimer: The author of this book was kind enough to reach out to me on Twitter about Cry of the Sea. She offered me a digital copy in return for my honest review, so here it is. Normally, I'm not one to pass up a young adult novel, but I will say this one probably would not have caught my eye or even been on my radar if it hadn't been for D.G. Driver. While I do have an interest in mythical creatures, For you eco-friendly and mermaid loving fans, you'll want to pick up this young adult novel. Normally, I'm not one to pass up a young adult novel, but I will say this one probably would not have caught my eye or even been on my radar if it hadn't been for D.G. Driver. While I do have an interest in mythical creatures, mermaids have never been one to spark my interest. I'll admit, I've even been stuck in the vampire and werewolf realm for too long, so reading about another mythical being was sort of refreshing. However, this book isn't just about mermaids. 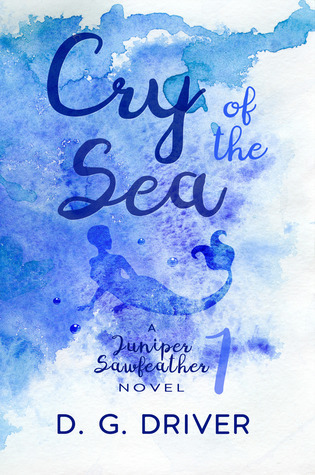 Cry of the Sea focuses around a high-school girl, Juniper Sawfeather. She is your typical teenage girl caught up in a not so typical lifestyle due to her activist parents. After a massive oil spill off the coast, June's journey in self-discovery takes many twists and turns as her and her father come across some unusual sea creatures who wash up on the shore covered in oil. With their new discovery of these human-like fish, things begin to get a little out of hand. People become curious about the mermaids, the company behind the oil spill becomes more of a threat than they ever imagined, and it becomes obvious how people can lose sight of the bigger picture when such rare things distract you from your mission. In the end, this environmentalism driven novel shows how one person, June, with a little help can be heroine not only for a cause but for herself. When I first started reading this book, I was a bit skeptical. I thought it was going to be cheesy or even too juvenile for me, but that was not the case. Driver's perception of mermaids is nothing compared to the Disney version. Don't expect these creatures to start singing a show-stopping tune. They are by no means flawless in beauty or capable of making deals with giant octopus's in return for sea legs. The mermaids in this book are given a "rough around the edges" approach. They are simply just sea creatures that people do not fully understand and are in danger of the public's fascination and irresponsible actions. As I put the mermaids aside and focus on the overall theme of this book, I really enjoyed this story more than I thought it would. I remember what it was like to not know my path in life or think I knew what I wanted to do. Sometimes we need certain moments in our lives to define us. We need those moments to guide us and open our eyes to what really matters in life and what we truly believe in fighting for. Cry of the Sea does just that. The writing flowed from page to page making this a very easy and fast read. The character dynamics were well developed and while I wasn't a fan of the high-school drama at times, I understood why it was included and stay true to the nature of the book and the main character. This is another fabulous read by Ms. D.G. Driver! If I was ever told that my parents raised me to be exactly like them, I'd freak too! Being a senior and a loser with only one other friend who happens to be your neighbor and every thing bad that linked you, contaminated her too was pure bad luck. But as luck may have it, June finds the adventure and friends for life. With two famous parents of the Indian American culture, Mother Nature is at the top of the totem pole. She's wonderful, great and if anything threatens her and her Nature, the Sawfeather family members are there. June's dad is major environmental activist and her mother is a lawyer for the environment going after big companies and anyone who threatens illegally and inhumanely. Although she's lived a whole 17 years under their lifestyle, it's hard to deny June wants something similar but not exact. Not until she meets Carter. He's a freshman in college and a hunk who doesn't care if she's stinky from dead animals or covered in dirt and sand from the ocean. He sees the pure heart of someone who cares about the world, about their one Mermaid. Going through self realization of who you wanna be, who didn't you want to be, who's your friend and why your reputation and popularity isn't up to par, she finds herself and finally together with her bff/neighbor that being who they thought they wanted to be isn't all that. What's important is rescuing June and Carter's friend the mermaid. The mermaid wasn't described as legends have painted them to be seem as but they were as lovely and can communicate. I do wonder... Is there more to June than what she knows? How is that she can communicate with the mermaid? Is there a sequel where we find out June is a mermaid too? But then they don't really look all human like Ariel I The Little Mermaid. Will June ever get to meet her mermaid friend again? Were the legends true of the mermaids and the killer whales and is there any magic involved? Can they transform? Why are they surfacing when crisis like oil spills occur but not swim deeper out into the sea? Is there a short story on the history and story of the mermaids and why they're surfacing or a personal story of the legends? Hearing when a mermaid dies is the saddest part of the story. But knowing this story is so much more.. heritage, high school and popularity drama, finding yourself, knowing who your friends are at the most important moments of your life, caring for the environment and bringing awareness about oil spills and large companies and how they can also corrupt the system and use false lies and hopes to cover up, finding love in the least likely places of all and knowing your parents support your every decision no matter how many mistakes, mishaps or what you choose and they are with you all the way even though the steps there could be bumpy. Juniper Sawfeather, June for short, is 17, in her last year of high school, and anxious to leave home to go away to college. Really, she just wants to get away from her overbearing activist parents. While her mom is a leading environmental lawyer and father runs to save animals from oil spills, fight deforestation, and so on, June understands their plight, having always helped the best she could, but she wants to pursue a career in whatever direction she feels best. That's the way this novel be Juniper Sawfeather, June for short, is 17, in her last year of high school, and anxious to leave home to go away to college. Really, she just wants to get away from her overbearing activist parents. While her mom is a leading environmental lawyer and father runs to save animals from oil spills, fight deforestation, and so on, June understands their plight, having always helped the best she could, but she wants to pursue a career in whatever direction she feels best. That's the way this novel begins, but it soon turns into a fast-paced page-turner full of suspense, shocking events, betrayal, poor judgement, and absolute unforeseen mystery. As a typical high school senior, June, isn't the most popular, frankly, she has one best friend, though arriving late to school on occasion and an assemblage of news reports about her parents' every protest, save this animal or that plant, certainly took its toll on her social life. That's not the most important thing to June. She really does care about the earth and all who inhabit it. She even cares about what her family does for a living, only sometimes it's hard to live life when others sneer and make snide remarks. She's used to it, it's been happening all her life. During a typical emergency mission June accompanies her father, she discovers something other than marine creatures struggling to survive on a beach after an oil spill. As soon as she makes this discovery, the novel leads you through one situation after another, uncovering the truth, or are they all just lies. The novel unfolds nicely, keeping the reader in suspense the entire time. There is no lag in the events which take place nor is there any disappointment in what is uncovered or revealed. It is a bit startling and shocking to learn who commits betrayal against her, though June did use poor judgement. Can this betrayal be reversed? As if finding mermaids isn't excitement enough, losing them only adds to the thrill of reading this story. It is guaranteed that you will not want to put this book down and you will feel compelled to read all the way to the end to absorb every last detail about the discovery, a friend's betrayal, an unlikely pairing of friends, the beginnings of romance, and the mystery of the mermaids. The characters are so real to life it's as if you know them and any teen would be begging June to allow them to go with her on her quest to save the mermaids. This is by far one of the best, well-written, excellent book for young adult readers and above. Cry of the Sea was unlike any mermaid story I've ever read. It was full of intrigue, passion, activism with a great message and it had a satisfying end. June (Juniper Sawfeather), is a 17 year old senior whose parents are full time activists who have dragged her along with them to protests and oil and pollution clean ups her whole life. As much as her parents want her to follow in their footsteps, June is adamant that she is going to be a Marine biologist and study at a university far away from Cry of the Sea was unlike any mermaid story I've ever read. It was full of intrigue, passion, activism with a great message and it had a satisfying end. June (Juniper Sawfeather), is a 17 year old senior whose parents are full time activists who have dragged her along with them to protests and oil and pollution clean ups her whole life. As much as her parents want her to follow in their footsteps, June is adamant that she is going to be a Marine biologist and study at a university far away from her parents and their crazy lifestyle. There is a massive oil spillage and June helps her dad on the initial evaluation of the damage at a small beach, when she discovers what she thought were humans, but at a closer look they have features that can only be mermaids dying on the shore, covered in copious amounts of oil. June and her Dad have to play this smart and they have to do it quickly before the oil company gets wind of it. The mermaids are taken to a marine clean-up facility where the intern Carter joins their crusade to protect the precious find. Somehow the oil company gets wind of the mermaids and that's when the battle to save these precious creatures begins. June is a beautiful young woman who knows what she wants in life. And she isn't bothered by her image or what the other kids at school think of her and her crazy parents. She has many enviable qualities. Carter is the dream guy that makes you swoon. He's smart, funny and caring. The chemistry between these two is instant and June's reactions brought back fond memories of my teenage years! Especially with the nasty popular kids trying to get in on the action. Seems like schools all around the world have the same cliche groups! There is a very strong activism theme that runs through the book, and at times it lost me a little, but I was easily brought back to topic. I really enjoyed the different take on mermaids. I'd love to see a drawing of what the author describes, just so the picture could be clearer in my mind, although Ms. Driver's description was excellent. What really blows my mind is that this could quite possibly be a reality. An extremely exciting prospect! The tragedy of the oil spill is reality that is very disturbing. The author clearly has a great knowledge or experience in this field. I really enjoyed this story and the seriousness of the topic. It made me realise that oil spills probably happen a lot more often than we realise. I started reading Cry Of The Sea on a rainy Thursday , and for the next two and a half days it completely kept me occupied .The book was written by D. G. River . It's about a high school student named Juniper. She's really just trying to get through her last year of high school , while dealing with her parents and their high expectations of her . Her parents are expecting her to follow the stones they set in the ground and become an environmental activist like they have been grooming her to be , but juniper (June ) has different plans. Before she knows it she goes from worrying about high school problems to worrying about saving a life . She makes an amazing discovery during an oil spill clean up with her father, and becomes passionately concerned with helping these new strange creatures. I like how these novel was a mixture of fantasy and sci-fi. I know it's young adult but to me it's a YA Sci-Fantasy Fiction. Aside from that it tells pretty well a life of an average high school student who's having a hard time to belong with people her age due to things that immature kids does. At first, when the mermaid was mentioned I thought the story would dive into discovering new world and all that. It did too, but the author did it in a way that is realistic and can be explained through h I like how these novel was a mixture of fantasy and sci-fi. I know it's young adult but to me it's a YA Sci-Fantasy Fiction. Aside from that it tells pretty well a life of an average high school student who's having a hard time to belong with people her age due to things that immature kids does. At first, when the mermaid was mentioned I thought the story would dive into discovering new world and all that. It did too, but the author did it in a way that is realistic and can be explained through human norms. The way the people reacted in the story can't be doubted as to how people of today would react if something similar would happen. As this also tells some of the struggles of adolescent going through the phase of wanting to be out in the shadow of their parents as well as surviving school, I'd say it's easy to relate to. For I believe that all of us had been through the same struggle at some point of our lives. The only thing that kind of bothered me was the way the mom, the scientist and the best friend was portrayed. I can't exactly see how the author wants the reader to perceive them. The mom sounded a bit fake to me who really wants glory and not just this cause she was fighting for. Then at the end she suddenly became a very dear mom who's very supportive of her daughter. The transition of her character was not played well and got me a bit confuse of how I'll view her. The best friend on the other hand, I felt like she should have done a litte grovelling before she was forgiven. I can't believe that everything just became okay. Or maybe because I'm this mean, vengeful person that's why I can't accept it's possible. The scientist, I wonder what happened to him after everything calmed down. I'm not sure if this is a series but the end of the book shows promise of more adventures to come that could may be give clarifications and answers that this book left behind. Juniper seeks to find her own path in life, but her activist parents have other plans. When her father takes her to clean up an oil spill, the pair make a discovery that will change the world. I loved, loved, loved Juniper’s character. Her American-Indian beauty, in addition to her level of maturity and sarcastic sense of humour had me hooked. She’s definitely the kind of person I would befriend in real life. Her passion and determination make her a force to be reckoned with, presenting her as a Juniper seeks to find her own path in life, but her activist parents have other plans. When her father takes her to clean up an oil spill, the pair make a discovery that will change the world. I loved, loved, loved Juniper’s character. Her American-Indian beauty, in addition to her level of maturity and sarcastic sense of humour had me hooked. She’s definitely the kind of person I would befriend in real life. Her passion and determination make her a force to be reckoned with, presenting her as a strong female role model. Juniper’s comedic style helped to lighten tense moments, of which there were plenty. She has a profound effect on other characters and their way of thinking that I admire. As for her best friend Hayley, I found myself shying away from her. Although she appears sweet at first, she seems like the sort of girl that will do anything to get a leg up on the rung of the popularity ladder. There were several times when I wanted to slap some sense into Hayley’s character as she aggravated me that much. I did love how the plot developed. The writing had a steady pace that held my attention and the drama with the leaked secrets had me on the edge of my seat, making me wonder what the outcome of everything would be. Did I have any dislikes with this story? Well, besides from Hayley’s character and her back-stabbing, I didn’t like the way that Juniper’s parents tried to force their views and careers on her. Their refusal to listen to her opinions on the matter was a situation that I could relate to. I’d rate this as 5 stars and would recommend it to avid readers of urban fantasy, as well as to those who are passionate about the environment and its preservation. In the story we meet Juniper Sawfeather, daughter of super activist parents who want her to be everything they are even though it's the last thing she wants. I really like Juniper's character from the beginning. She shows strength and bravery and it thrilled me to see. Juniper is a regular senior high school girl, who can't wait to leave the small confines of her school and home to become an incredible marine biologist. When her mother calls to tell her father about an oil tanker unsafely traveling through the ocean possibly endangering all the sea life Juniper and her father rush to their nearby beach with hopes to help any animals injured and get proof of the oil companies nefarious dealings. That's when they discovered mermaids... yes that's right 3 of those beautiful mythical creatures wash up on shore covered in oil. After rushing the only surviving mermaid to the nearest aquarium she meets Carter and Dr. Schneider who are quick to help. Only the mermaids are stolen from the aquarium and we follow along on the wonderfully intriguing adventure as Juniper, along with Carter, and the group of popular kids from school as they try to figure out just who has the mermaid and what is actually going on. D.G Driver created a wonderful story filled with magical creatures and strong well thought out characters. I recommend this book to everyone especially younger readers looking for a good easy read. In Cry of the Sea a young girl named June is thrown into a world of which she knew nothing about when her father and she discovers mermaids due to an oil spill. June finds herself trying to stay one-step ahead of the oil companies and media while doing what it takes to make her environmentalist parents happy with her. We are led through a journey in which takes several twists and turns, leading June to make new friends and enemies along the way. I found this story to be extremely interesting giv In Cry of the Sea a young girl named June is thrown into a world of which she knew nothing about when her father and she discovers mermaids due to an oil spill. June finds herself trying to stay one-step ahead of the oil companies and media while doing what it takes to make her environmentalist parents happy with her. We are led through a journey in which takes several twists and turns, leading June to make new friends and enemies along the way. I found this story to be extremely interesting giving the idea of a mermaid a new shape and look, one that you would not normally associate with the half human, half fish myth. It also makes a person step back and wonder what they are doing to make the world a better place to live when you hear how some of the animals die and the damage the oil vessels do in the open waters. I found myself slightly upset with the way the story ended, but realize it set up a perfect opportunity for a sequel. I look forward to seeing more stories where I can see how June finds herself in her parents’ world and to protect the mermaids she has grown to love. spill, her life is changed drastically when she discovers mermaids covered in oil. mermaids. And I liked the small romance that developed between Carter and June. Cry of the Sea is a book filled with deeper meaning. June is a senior in high school, the daughter of activists and the discoverer of mermaids! This story, is about making the right choices for the planet, helping others to see that we need to make changes, Cry of the Sea is a book filled with deeper meaning. June is a senior in high school, the daughter of activists and the discoverer of mermaids! This story, is about making the right choices for the planet, helping others to see that we need to make changes, and learning how to comfortable with your own life. June deals with so many issues it forces her to make the tough choices. I really enjoyed reading this book, not only does it bring our environment to the forefront, We see June deal with bullying, romance, family, authority as well as peer pressure. The pace is steady, I didn't feel the story was forced or lagging at any point. I do wish we had a little more interaction with the mermaids, but the ending leaves me hopeful for another book in the series! Highly suggested for your next read! Juniper Sawfeather, June for short, is a highschool senior ready to be out from under the cloud that her parents activist lifestyle has her under. While she helps with protests, research videos & pictures, and cleanups she yearns to have a slightly different life then her parents have shown her. In the beginning they don't see eye to eye. But after encountering mythical creatures, betrayals, and lies her parents start to realize there's more to June then what they're seeing. This story is a Juniper Sawfeather, June for short, is a highschool senior ready to be out from under the cloud that her parents activist lifestyle has her under. While she helps with protests, research videos & pictures, and cleanups she yearns to have a slightly different life then her parents have shown her. In the beginning they don't see eye to eye. But after encountering mythical creatures, betrayals, and lies her parents start to realize there's more to June then what they're seeing. This story is a part of one girls journey to be seen while coming to understand more of the life around her. D.G Driver gave the reader a more mythical look at mermaids. Sucking the reader in with out the Hollywood mermaid look. While managing to expose us to real life problems that June had to face and constantly deal with. The writing style was spot on with what I love and the story had a long easy flow to it keeping my attention. I give it 4 out of 5 stars and look forward to, hopefully, one day reading another part of June's journey. Review Excerpt: Overall, Cry of the Sea is wonderful book by an author with some serious talent under her belt. I loved that it addressed very real concerns, but was also written in such a way that you sympathized with the main character and her run-of-the-mill teenage troubles at the same time. It is definitely true to its YA heading, though, and people who fall outside of its intended age range may view it as a little too ‘dramatic’ , but the YA world needs more strong female characters in it, Review Excerpt: Overall, Cry of the Sea is wonderful book by an author with some serious talent under her belt. I loved that it addressed very real concerns, but was also written in such a way that you sympathized with the main character and her run-of-the-mill teenage troubles at the same time. It is definitely true to its YA heading, though, and people who fall outside of its intended age range may view it as a little too ‘dramatic’ , but the YA world needs more strong female characters in it, so I’d say D.G. Driver is doing a fantastic job. Really enjoyed this tale and read it one night. The characters are great, and the idea of mermaids taken in this context intriguing. There is an important message within the book, but this never interrupts the action. Highly rec for a winter read! Juniper Sawfeather rescued a mermaid! Can she keep the mermaid safe though? Has the struggle and angst of high school as well. Review in my GoodReads author blog.